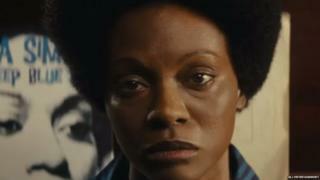 A forthcoming biopic about singer Nina Simone has faced fresh criticism over its film trailer which shows lead actress Zoe Saldana with darkened skin. Her casting as Simone was criticised when it was announced in 2012, with Simone's daughter suggesting she was "not the best choice". A tweet this week by Saldana, promoting Nina, was met by a furious response from the late singer's twitter feed. It read: "Please take Nina's name out your mouth. For the rest of your life." A later tweet, posted on the official Nina Simone account on Wednesday, summed up the depth of feeling in the Simone camp: "Hopefully people begin to understand this is painful. Gut-wrenching, heartbreaking, nauseating, soul-crushing. It shall pass, but for now..."
The renewed criticism comes after a poster and trailer for the film were released on Wednesday, ahead of the film's official release on 22 April. Saldana, who is of Dominican and Puerto Rican descent, drew backlash for taking the role of the world famous jazz singer and civil rights activist, after photos first surfaced of her in the role wearing an afro wig and with clearly darkened skin. Writing on the official Nina Simone Facebook page in 2012, daughter, Simone Kelly, wrote: "I love Zoe Saldana, we all love Zoe... From Avatar to Colombiana, I've seen those movies a few times. But not every project is for everybody. And I know what my mother would think. I just don't get it…"
With the issue of race playing such a pivotal role in Simone's story, many fans of the singer felt an African-American actress would have been more suitable. Saldana, 34, replaced singer Mary J Blige - who dropped out of the project due to scheduling conflicts. The unauthorised film biopic focuses on the last eight years of Simone's life and the relationship between the singer and her then-manager Clifton Henderson, played by British actor David Oyelowo. Ms Kelly is on record as saying she would have preferred to see Oscar-winner Viola Davis in the role, or Beloved actress Kimberly Elise. She told Ebony magazine in 2012: "Both of the actresses that I've mentioned are women of colour, are women with beautiful, luscious lips and wide noses, and who know their craft." "I also have no problem introducing someone we've never heard of before who can play my mother." Last year, Star Trek actress Saldana told InStyle magazine: "I didn't think I was right for the part, and I know a lot of people will agree, but then again, I don't think Elizabeth Taylor was right for Cleopatra either... An artist is colourless, genderless..."
Aaron Overfield, who manages Nina Simone's official website, reacted angrily to the newly released trailer on his Facebook page: "It took them THAT long to end up with ... THIS? There is a special place in hell reserved for this film." The film will be hoping to benefit from renewed interest in Nina Simone, following the critically acclaimed Netflix documentary What Happened, Miss Simone? - made in conjunction with the Nina Simone estate - which was nominated for an Oscar last weekend. The documentary includes previously unheard recordings, archive footage and interviews with those closest to the singer, recorded over three decades.